Georges Laraque, noted hockey tough guy but also noted for his variety of interests outside of the hockey rink, has made the biggest splash in terms of making headlines with his new autobiography. In Georges Laraque: The Story of the NHL's Unlikeliest Tough Guy, Big Georges rocked the hockey world with allegations of rampant drug use. He also took a few jabs at some coaches, most notably Wayne Gretzky. He also goes on to talk about all sorts of subjects - from racism to politics, from humanitarian efforts to vegan diets. All in all I enjoyed this book. It was a simple read (no, it was not written in crayon as a couple of would be funnymen asked me) which made it flow by easily. I feel big Georges was very honest in his commentary, though I would be curious to hear the other side of the story when it comes to a couple of his more controversial departures. 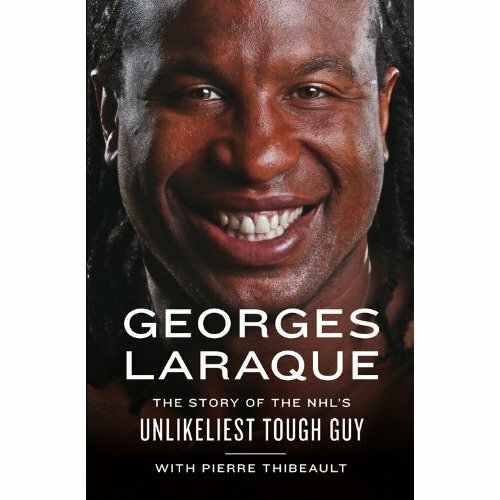 I came away from reading this book with more respect for Georges Laraque, both as a hockey player and as a person. Regarding his various off-ice interests, he never preaches about any of it, other than just to live your life to the fullest and to your own principles. Think you know NHL tough guy Georges Laraque? Think again. Known as a player who was unfailingly respectful and gentlemanly even when he was going toe-to-toe with the toughest guys in the toughest league in the world, today Laraque takes that courageous sense of what is fair into fights that are much more important than the outcome of a hockey game. The son of Haitian immigrants, Laraque campaigns for World Vision to help with Haitian relief. A committed believer in animal rights (and probably the toughest vegan in the world), Laraque is a spokesperson for PETA. A conscientious environmentalist, Laraque stepped up to be the deputy leader of the the Green Party. In this intimate, often surprising biography, Laraque tells the story of a hockey player's life that is unlike any other, from a childhood facing racism in Quebec's minor hockey system, to the thrill of the Stanley Cup Finals as an Edmonton Oiler, and sharing a dressing room with Sidney Crosby—and from dropping the gloves on the ice to refusing to back back down from much more serious fights off the ice. Honest, startling, and brave, this is a portrait of a hockey player unlike any you've seen before.